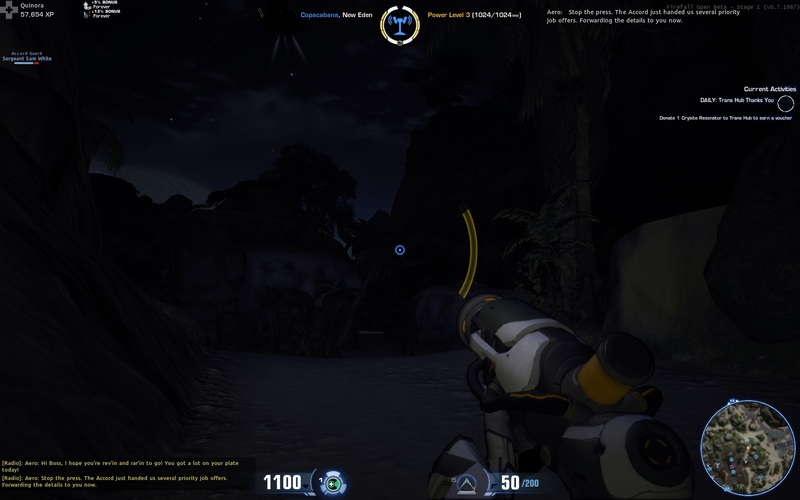 Home » Games » Firefall » Firefall stole my time. I logged in surprised to find that my character I made back in January was still there. Great, I don’t have to take the time to make a new character. Since I had not played much with her so I should be able to start back in and figure things out. A this loading screen I was having a good time. I load up and am faced with, in my opinion, atrocious looking character model standing an odd pose with a head that looks way to small. “Umm. Why does my body look so thick and stand really weird?”, I asked as I progressed through the tutorial. The tutorial was fine, the frame rate was ok, the shooting was fine, and the game did a fine job of teaching me about my skills. Oh and I Jump pack, I had somehow forgotten about that. I’m still having an ok time. 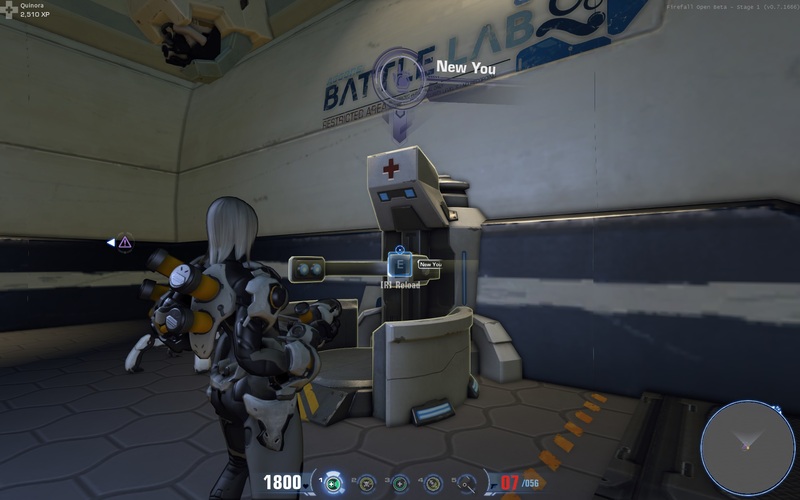 I pass a New You station and I laugh out loud at the Borderlands reference. Nice I hope this will be my chance to fix my body. This body is apparently the only one female characters get, why does it look so ‘off’ compared to the males. Hmm, well at least with my BattleFrame on it is not as bad. Saddened but fine whatever, I head off to the main game. I step out and have the voice in my head tell me about Syncing the SIN tower. That sounds like Assassins Creed or any other open world game mechanic, and I’m a sucker for that. So I do as she says and head off. I activate it, my map view expands, 1/12, and the voice says she detects another. Well that appears to be my main mission, so I follow along and head off in the dark toward the next one, finger on the trigger waiting for some enemies. Fast forward an hour, and at 9/12 towers later. I have yet to see anything to shoot at and I’m not even sure what the story is supposed to be. Heck most of the time I was running blind since it was night time, and they made the game crazy dark. The sun finally came up, and I can actually see the world now. I’m not instantly wowed but it is pretty enough and full of color, sadly it was also devoid of anything interesting for me to encounter. Then while on my way to tower 10, I actually see a fire fight. Several players were being attacked by something and since I was in the Biotech frame, the tutorial taught me that I can heal, I jump that direction hoping to help them out. I shoot a few things, I have no clue what they were since the particle effects from the fight were obscuring the enemies, and the framerate and lag was getting bad, but I keep shooting until I see one of the other players Health bars getting low. That is when I realized I have ZERO of the abilities the tutorial taught me about. What? Ok I must have missed something back in town. The fight ends and I fly straight back to town. That is when I discover that you have to unlock all of the core abilities the tutorial taught me. At this point the game was lagging very bad, which was odd since I saw so few players or enemies, and eventually I crashed. I stepped back and realized, I just spent over an hour doing basically nothing interesting. So I stopped for the night. Frustrated. This should not be the challenge of the game.This evening I decided to give it another go and at least see about unlock a heal ability. Though first I had to deal with a buggy 2 factor authentication system for about fifteen minutes before I could even log in. With the authentication and log-in mini game complete, I unlocked the heal and set off to complete that tower mission the voice in my head kept prattling on about. Which I did completely uncontested and only seeing a few other players, and Zero enemies. Confused. It was here when I stated asking myself what the point of the game was. Planetside 2’s start was harsh, but you were in combat instantly. Defiance Presented me a mostly coherent story and gave me direction right out of the gate. Firefall dropped me off at the Copacabana and said have fun by yourself. It feels like all of the content is missing. Now I’m not only bored but getting a bit frustrated that I must be doing something wrong. Then as I wander away from that last tower, I see something in the world that says something like crashed thumper. I click on it and a little collect the part in time mission starts up. Sadly that lasted only a few minutes, and I was once again left alone. Bored and a bit saddened that I had no direction or story. A co-worker laughed at me, and suggested I head to the beach and throw a party, like one I attended last weekend in FFXIV. Well, that sounded better than anything the game was giving me to do. So I headed toward the beach hoping to tell anyone I saw along they way about my party. I saw no one. I arrived on the beach, but I couldn’t figure out how to take my battle frame off and get casual. Fine. “Well there better be a /dance!” That was a mistake. Horrified. That dance animation is now burned into my head, and not in a good way. It was then, when I hit Alt-F4 and posted my initial message to G+. I play a lot of games, and I pay for a lot of games. M any of those game are not that good, but even then I still find some enjoyment from them. All this game did was take my time with nothing given in return. I’m not going to say other people might be able to enjoy the game, but it is not for me and I would not recommend it to anyone. Maybe I will come back to it in another six months and see if they have added any content or fixed whatever bug it was that made it so I had zero story. Maybe.